Members of two criminal gangs, Los Zetas and La Familia Michoacána, engaged in a half-hour gun battle in Uruapan, Michoacán, Monday, resulting in one dead and six arrested. [Two other periodicals put the arrests at nine.] The combat also included fragmentation grenades. 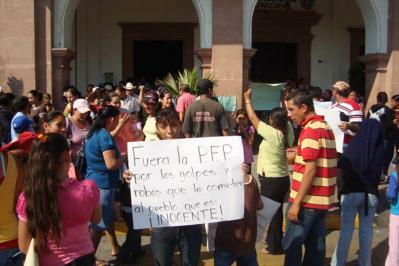 It began when the La Familia group attacked a house where Los Zetas were holed up. Los Zetas held their ground and the noisy activity caught the attention of the Mexican military and several police agencies. All converged on the area to make the arrests. In a presumed attack by one criminal gang on another in the state of Chihuahua, two brothers, five and ten years of age, died when the barn where they were sleeping caught fire. Their sister, seven, escaped alive, but with severe burns. The attack took place around midnight when an armed group fired into the structure located near the town of Balleza, in mountainous country west of Parral. The children’s parents, indigenous Tarahumara, were at a festival nearby at the time. Responding to a report Monday morning, Tijuana police found a body of a man, 25 – 30, hanging from a bridge in the city. The victim showed signs of torture and a bullet hole in his head. An accompanying narco-message indicated he was the victim of gang rivalry.